Suwarrow was described in 1890 by Mrs Robert Louis Stevenson as "the most romantic island in the world". It wasn't the model for her husband's famous book (that was actually published seven years earlier), but the atoll is a true Treasure Island. Today, Suwarrow is a treasure island of another kind. It was declared a National Heritage Park in 1978 The island itself, its reef and a six kilometre area around it are totally protected under Cook Islands law. Yachts require special permission BEFORE visiting the island. Few people know that Tom Neale was not the only person to live alone on Suwarrow. In the summer of 1965, a 23 year old former art student from London, Michael Swift began nearly a year of life as a hermit on the remote island. He persuaded New Zealand brothers, John and David Glennie to put him ashore with his possessions after joining the crew of their trimaran, 'Highlight' at Tahiti in July, 1965. He spent the first two months living mostly on uto which is the nutritous kernal of the mature coconut because he didn't know what else was safe to eat. His home was the hut formerly occupied by Tom Neale. But Swift was an illegal immigrant according to the Cook Islands government because he had no permission to stay on the island. On 2nd December, 1965, John Tariau - then MP for Pukapuka - sailed into Suwarrow lagoon on a mission to tell him so. Swift told him he'd found peace and contentment on the island and under no circumstances was he returning to Europe. He signed an indemnity paper absolving the government of any responsiblitity to send a vessel to take him off the atoll, and before being left alone again he was presented with supplies and given tips on survival. He turned up in Rarotonga in April, 1966 and left a few days later for New Zealand. He said he intended to return to Suwarrow, but when he learned in 1970 that Neale was back on the atoll, he went to live on Aitutaki instead. He's reported to have said that Suwarrow wasn't big enough for both of them! "I chose to live in the Pacific islands because life there moves at the sort of pace which you feel God must have had in mind originally when He made the sun to keep us warm and provided the fruits of the earth for the taking.."
From Tom Neale's Book "An Island to Oneself"
Tom Neale was a sailor who dreamed of living alone on a tropical island. He read about Suwarrow in a book and when his ship stopped there in 1945 it was love at first sight. He finally got Government permission in 1952 to live there and in October that year became a modern Robinson Crusoe (but minus a man Friday). For 15 of the next 25 years he lived alone on the island, tending his garden and chickens, catching fish and coconut crabs. In 1966, a friend helped him publish his story, "An Island to Oneself". It's a fascinating, and at times, incredibly moving story, particularly when Tom is bed bound and on the verge of death only to be rescued by the first boat to call at the island for more than a year. This "hermit of Suwarrow" stayed on his dream island until 1977 when stomach cancer forced a return to Rarotonga. Tom died that year at the age of 75 and is buried in the RSA Cemetery on Rarotonga. The Island takes its name from possibly the most famous - some also say the greatest - Russian General of all time, Alexander Vasilievich Suvorov. But he had been dead for 13 years by the time it was was discovered. A vessel bearing his name, under the command of Mikhail Lazerev (or Lazareff) landed on 17th September, 1814. It's one of only two islands in the South Pacific to bear a Russian name (the other is Vostok which is north of Tahiti). 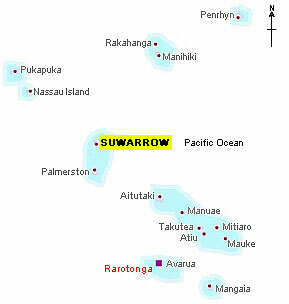 Although Suwarrow is part of the Cook Islands and administered as such, it is deemed to be Crown Land which means Her Majesty the Queen (Queen Elizabeth II) is the official land owner. Summary of the only published account I can find of Michael Swift's stay on Suwarrow - from "Sisters in the Sun" by A.S. Helm and W.H. Percival (published by Robert Hale & Company, 1973). "KIA ORANA COMRADE. WELCOME TO THE NEW RUSSIA"
A completely bizaare story emerged in 2011 about a Russian politician, businessman and human rights activist who claimed he bought Suwarrow from the Cook Islands Prime Minister (he definitely didn't and anyway, as the Queen owns the land, only she could sell it). Anton Alekseevich Bakov (left) told the popular Moscow newspaper, 'Isvestia' that he paid millions of dollars for it and it was now the capital of a revived Russian empire. In early October, the self-declared Prime Minister set off to visit his claimed territory, but the trip came to an ignominious end. The vessel he chartered to take him to the island turned back at his request because he was too seasick to continue the voyage! In the mid 19th century, a ship from Tahiti was carrying out salvage work on Suwarrow's reef when its captain unearthed an old iron chest near the shore on Anchorage Island (one of the islands in the lagoon). It contained gold and silver coins valued at the time at US$22,000 (about US$5 million today). And in 1876, a New Zealander, Henry Mair discovered gold and silver necklaces, brooches and coins in a rusty box which a turtle uncovered while laying its eggs! He had no means of carrying it away, so hastily reburied it and carefully noted its position. But Mair was clubbed to death by natives in the New Hebrides in 1891 and his written record of its location was never found. Eleven species of seabirds breed on the island. It supports regionally significant colonies of Lesser Frigatebirds (9% of world population), Red-tailed tropic birds (3% of world population) and the Cook Islands only large colony of Sooty Terns. Suwarrow also has the largest congregation of Lesser Frigatebirds in the South Pacific.